Let's build an API for a better tomorrow! Vote NONECK! Vote & Share your support! The polls will be held open to receive what are called “proxy” votes between then and the start of the NY Tech Meetup’s Annual Meeting, which will be 3pm on December 17th, at Meetup HQ, where the sole idem of business will be to tabulate and validate the vote count from the Meetup.com system, and determine the election results. Leave a comment at the bottom of this page indicating your support and/or throw in a link to your blog post, email posting, or twitter link. I’ve also been using “VoteNoNeck” as a twitter hashtag. 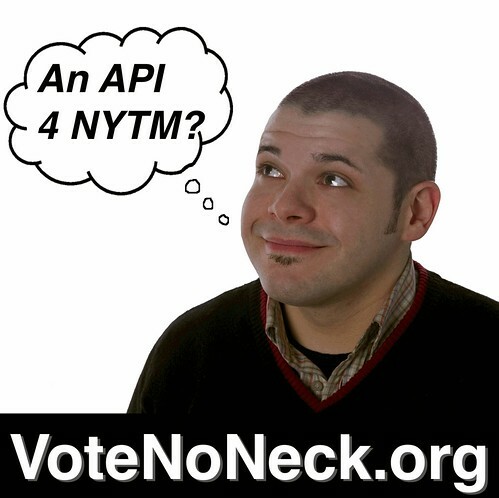 If you want to show your support blog, tweet or share this gratuitous image with a link to VoteNoNeck.org.